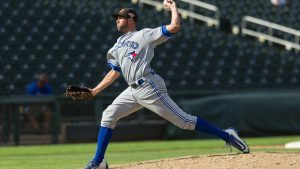 Left-handed pitcher Tim Mayza reached his childhood dream of pitching in the big leagues during the 2017 season. That dream took a lot of hard work to achieve, as Mayza has experienced some ups and downs during his minor league journey. Dealing with a few of those downs in double-A in 2017 didn’t slow Mayza down. In fact, the lefty was able to put his early season struggles behind him thanks to the help of Vince Horsman. That help showed when Mayza moved up to the triple-A Buffalo Bisons in July. Allowing just two earned runs, and maintaining a 0.93 ERA in triple-A was great to see. As expected, Mayza speaks very highly about both of his minor league stops in 2017. Those improvements in Buffalo earned Mayza a major league call-up in August. Getting into his first big league contest in the 9th inning of a 6-4 defeat by the Tampa Bay Rays; was a moment that Mayza will never forget. Mayza would go on to log 17 big league innings in 2017. Finishing his season with a 1.65 WHIP wasn’t completely ideal for the prospect, but it gave Mayza an idea of what it takes to succeed at the major league level moving forward. He believes his struggles came about due to the adjustments he made to his mental game in the majors. Sharpening his 4-seam fastball, 2-seam fastball, changeup, and slider will be focal points this off-season for Mayza. Along with that, Mayza wants to get stronger and work on his mechanics, too. Toronto Blue Jays fans hope that Tim Mayza can get stronger in the areas he wants this off-season.